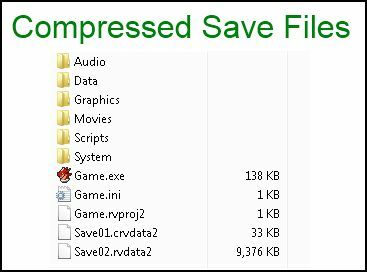 This script compresses all save files, resulting in smaller save files. For backwards compatibility, if a compressed file is not available, it will try to load the uncompressed file. Compression results may vary depending on the data. Interesting script, but what’s the point when save files are negligibly small, especially so when compared to a game’s audio and graphic files? There isn't much point when you know your project will never have large save files. For others that may not be the case.